First Impressions: Is The Flash or Constantine 2014's Break-Out Show? It's preview night at Comic-Con, and DC showed the pilots for two of its upcoming new shows: Constantine and The Flash. And they were both good! Here are our spoiler-free first impressions. The best thing about The Flash's pilot is that it takes advantage of the fact that it's living in an already-established world. It's basically Arrow, but lighter. Literally lighter: there's a lot more brightness in Central City than in Starling. Which fits Barry, a character much less prone to brooding than Oliver. Even though it's the origin story for Barry Allen, it feels like an episode of a series rather than a straight-up pilot. While it doesn't require you to know Arrow, there's a comfort with the universe that few pilots have right out the gate. Which is the benefit of having done a backdoor pilot during Arrow, I guess. "Comfortable" is the best word for the pilot. If you like Arrow, you'll like The Flash. Alternatively, if you don't like Arrow, this is not for you. I do worry that the pilot, which is good, will suffer from the high expectations built by Arrow. Coming off that show's epic build, this is just going to seem smaller. Of the supporting cast, Jesse L. Martin and Tom Cavanaugh stand out the most. Neither is playing outside their comfort zone (Jesse L. Martin is a cop? Really? ), but that's not a bad thing. Martin's Joe West is as comforting a presence as you'd think he is. And Cavanaugh also hits all the right notes as Dr. Harrison Wells. And he has a lot of notes to hit. He ends up being the most complicated character in the pilot. From successful scientist, to craven scientist, to being Barry's encouragement. Plus, there's the whole ending thing he has to pull off. Yes, there are a ton of comics references here. And a call-backs to Arrow. It's not just viewers who are seeing them, the pilot is explicit about tying the two together. Including a significant cameo. Conclusion: if the worst that can be said about The Flash is that it lives up to expectations, that's great. This show knows exactly what atmosphere it's going for. It plays with shadow and light extremely well, creating a world were the supernatural infiltrates the mundane in a creepy way. And, holy crap, the detail. There's detail in every frame of this thing. The trailer already revealed an Easter egg, but that whole scene fills the screen with stuff to look at. Kudos to the production design, because every space looks real and fits into the show's overall dark tone. Finally, the effects are really good, too. That's always a concern for a TV show that has to stretch a budget across a large number of episodes. Of course, they could have blown it all on the pilot, but I really hope not. 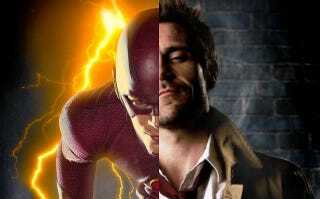 It looked so good that The Flash, which had its pilot screened before and after Constantine suffered in comparison. In particular, the scenes where the character Liv (Lucy Griffiths) "sees" the spirits, ghosts, demons, what-have-you around here do not look at all cheesy. They are genuinely scary. For all we've heard about the changes being made to the character for the screen, Matt Ryan is unaffected by any of it. He's great. The very beginning of the pilot introduces him in pretty bad shape, and Ryan plays it all: anger, desperation, and the inability to run from his own knowledge. And he's funny. He delivers the lines that are jokes perfectly, without overplaying them at all. He also makes mistakes. That's made repeatedly clear throughout the pilot. For all that Ryan's Constantine has plans for everything, he very nearly messes it all up because of his guilt. One of the problems with the pilot was that the rest of the characters didn't feel nearly as lived in as Constantine. Except maybe Jeremy Harris as Ritchie Simpson, whose rant about all the drugs he's on now is very well delivered. Harris and Ryan, in their one scene together have the best chemistry of any other pairing. Harold Perrineau's Manny the angel and Constantine's combative relationship doesn't quite gel (although, he is the reason for one the episode's greatest effects, even if it serves little purpose to the plot). He's supposed to be smug and superior, but Perrineau's not quite bringing the authority needed to make it believable. The character of Liv is the elephant in the room of the pilot. Lucy Griffiths was let go and the character isn't being recast. They're adding another female character, Zed, instead. The problem is that the whole pilot revolves around bringing Liv into Constantine's world and using Liv as the character who receives exposition. She's the character who grows in the pilot: She's the target of supernatural begins, she learns she has new powers, and she's the one who keeps Constantine from making a mistake. If you watch the first trailer, there's a snippet where Liv says "I need to find these things and stop them, and I can't do it alone." That's been replaced with an explanation of why we're not going to be seeing Liv anymore. Which ultimately makes it hard to get a sense of what the show's going to be. We see a few things from Constantine's past that are obviously going to come up again and we hear from Manny that there's something coming. But the pilot seemed to be a whole episode about recruiting Liv to the cause and setting up a show with her learning new things and acting as the "seer" of the supernatural. So her leaving was really unsatisfying. Ultimately, though, Ryan is the real draw here. You just want to spend more time watching him after the pilot, and that's more than enough to put it on our "watch" list.